In the latest video from the recent CMA National Convention in Toronto, Andy Nulman of TXT-TV made his pitch about what the channel is and what marketers can do with it. TXT-TV is an alpha-numeric cable channel where the programming centres on SMS comments/answers from viewers via their smart phones. An alpha-numeric channel simply means there is no actual motion video broadcast. Some animated images, but you won’t see much more than still images and scrolling text. I’ve spent time watching TXT-TV and for a sometime professional lurker such as I, it was strangely hypnotic. I can see why this could be a tasty distraction and it might even keep the babysitter out of your fridge. 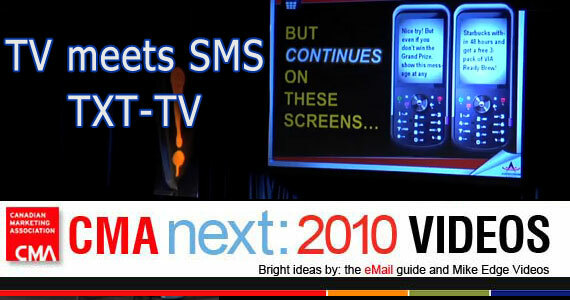 TXT-TV will live or die fundamentally on its ability to build a core community. Most online communities have more lurkers than they do participants and that’s not really a problem if you still get the eyeballs on the sponsor messages. But you do need to have that core community actively participating in order to keep others lurking. TXT-TV wants to accomplish this with a variety of shows where you can participate in a trivia game, choose the cutest pet between two uploaded photos, test your word power or even test the future of your relationship. All the while the SMS chatter continues in the background or perhaps it’s the foreground. They also have tied the channel in with their website by smartly giving people the opportunity to create a persona via the site with unique user names and avatars. TXT-TV broadcasts 15 minute segments – presumably to best cater to the short attention span of texters. The messaging is pretty typical stuff, much like one would expect to find in any online chat room. When I checked it out they also seemed to have full time moderators keeping an eye on things and acting as casual hosts. 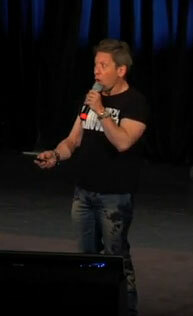 Takeaway: I can see one problem with getting your 15 minutes of fame on TXT-TV, you might end up being “type cast”.